Repetition Repeats all Other Repetitions is performed in the Listening Room at ICMC in Huddersfield. I will also do a presentation of the IntegraLive software that I've collaborated on at the conference. Since 1974 the International Computer Music Conference has been the major international forum for the presentation of the full range of outcomes from technical and musical research, both musical and theoretical, related to the use of computers in music. This annual conference regularly travels the globe, with recent conferences in the Americas, Europe and Asia. This year we welcome the conference to England for the first time. 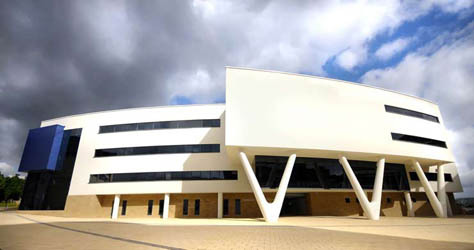 The 2011 International Computer Music Conference will be hosted by CeReNeM, the Centre for Research in New Music, at the University of Huddersfield, England. As always the conference welcomes the submission of a wide range of papers and music, covering all aspects of technical, creative and aesthetic issues around the use of computers in music. The theme of the 2011 conference is innovation : interaction : imagination emphasising the importance for our field of innovative technical developments, imaginative responses to new situations and, above all, the creative interaction of the technical and the musical. Submissions emphasising this theme are particularly welcomed and, following from last year, ICMC 2011 will again include a piece plus paper category in which it will be possible for such links to be made explicit. The conference will also be programmed to juxtapose paper sessions on particular topics with concerts in which related ideas inform musical works.